Header Logo: This is a 40x40 square logo that will appear on your support site next to the support site name. You should provide a full URL to the image you wish to use. Favicon: Similar to the header logo, provide a full URL to the .ico file you wish to use. Custom colors: Depending on the theme you have chosen, you may see different options here. These color pickers allow you to change the color scheme of your Help support site. 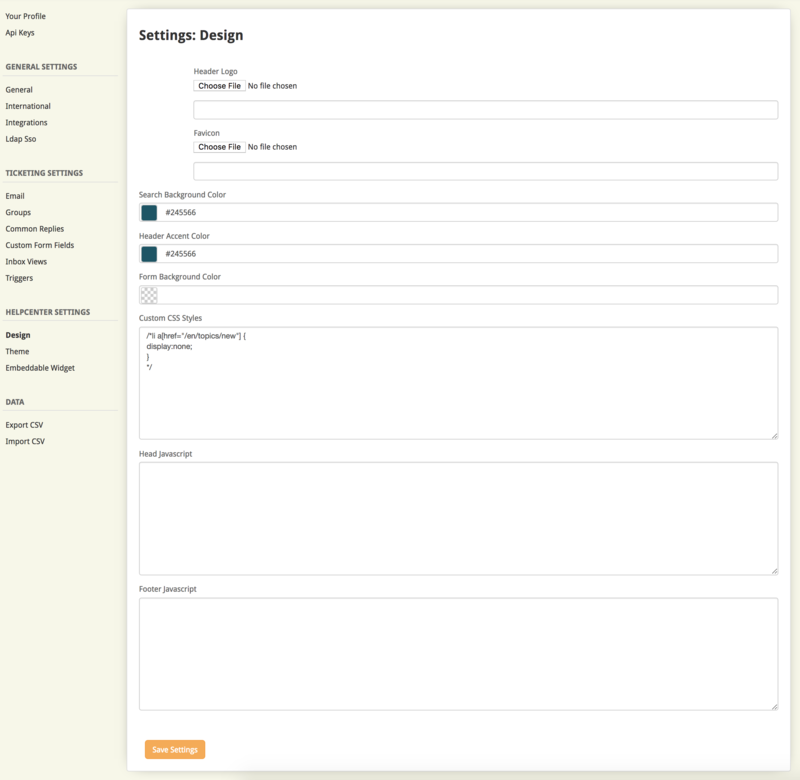 Custom CSS: To customize your design further, you can add custom CSS that will override the default values used by the support site. I changed the colors in the fields for "Search Background Color" and "Add Form Background" just to try it out. However I want them to both be empty and transparent but I cannot put them back to that value. I can change to other colors but cannot save back to an empty value. I tried to set them to transparent using the custom css field and this works for the home page but not for the knowledge base. Unfortunately, I don't think there is a good way to set it back to empty, other than by using the API.